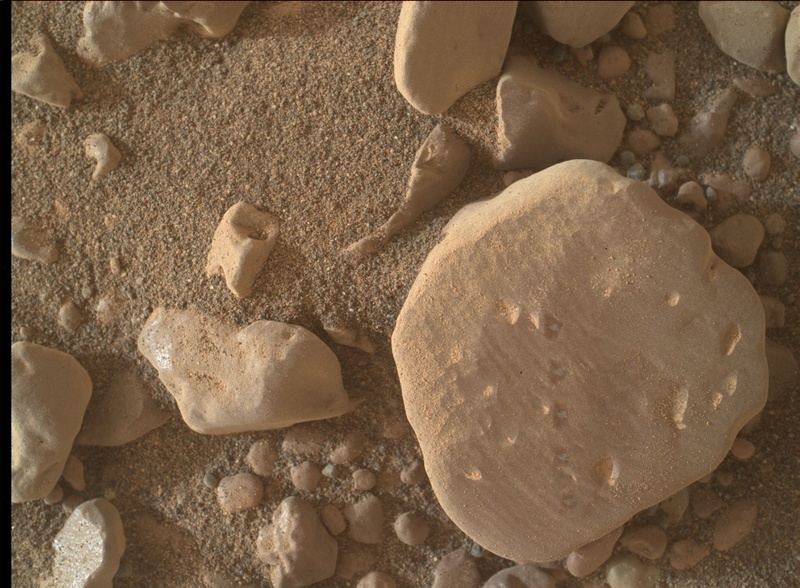 The accompanying image shows the target "Brent" in the lower right corner; it was analyzed with ChemCam and APXS, and imaged with MAHLI over the weekend. It is a rounded pebble roughly an inch (2.5 cm) in diameter. In spite of the fact that it has been rounded by mechanical abrasion, it still shows faint layering. You can also see inclusions that are partially filled with brighter material. Marching vertically across the face of the pebble are five laser pits from ChemCam. The bottom of each pit has a telltale whitish appearance. Over the weekend Curiosity completed a 20-meter drive. Curiosity is heading east and will be driving below the upper side of Vera Rubin Ridge, toward waypoint 2. One of the goals for this portion of the traverse is to image the rock layers along its upper slope, but so far the slope appears to be mostly covered with soil. Today's plan includes observations of what appears to be small bedrock targets, with Mastcam, APXS, ChemCam, and MAHLI observations of target "Isbister," ChemCam RMI-only observation of "Magnus," and Mastcam observation of the ChemCam AEGIS target from the weekend. Mastcam will also image "Knockfarril Hill," "Crawton," and "Elgol." Following a planned 44 meter drive and post-drive imaging, MARDI will get a view of the pebbly surface in the new location, and RAD, DAN, and REMS will take data. On the second sol there is a 360 degree Mastcam mosaic and Navcam horizon and dust-devil surveys. The plan also includes a number of engineering checks, including one on the current thermal environment.